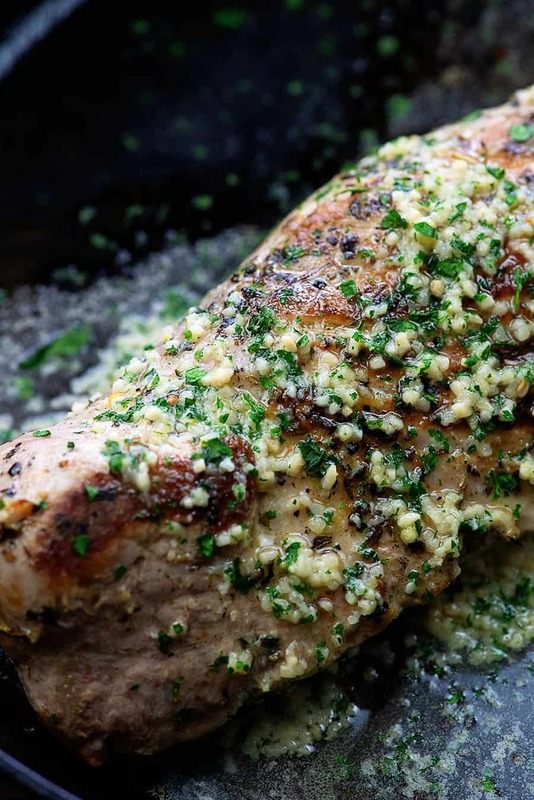 Garlic Butter Pork Tenderloin - the juiciest pork tenderloin you'll try! 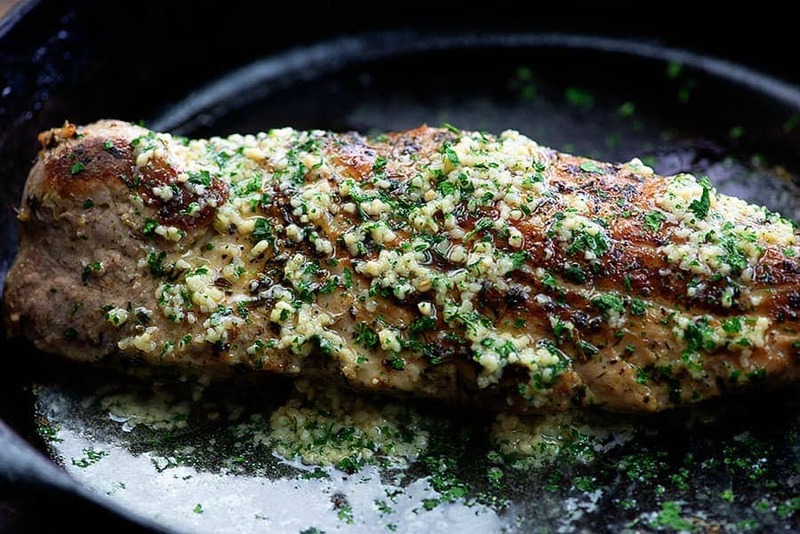 Pork tenderloin, seared to perfection, finished in the oven, and then topped off with a decadent garlic butter. Would you believe this recipe is ready in about 30 minutes and it’s naturally low in carbs? I snagged a couple of pork tenderloins at the grocery store the other day. They were on sale and I’m all in for pork, so I couldn’t pass them up. Of course, I had no idea what I was going to do with the pork tenderloin when I got it home, but I figured an idea would come to me. I asked Chad what he was feeling for dinner one night and he said he wanted something extra buttery and extra garlic-y, so I just went for it, you guys. 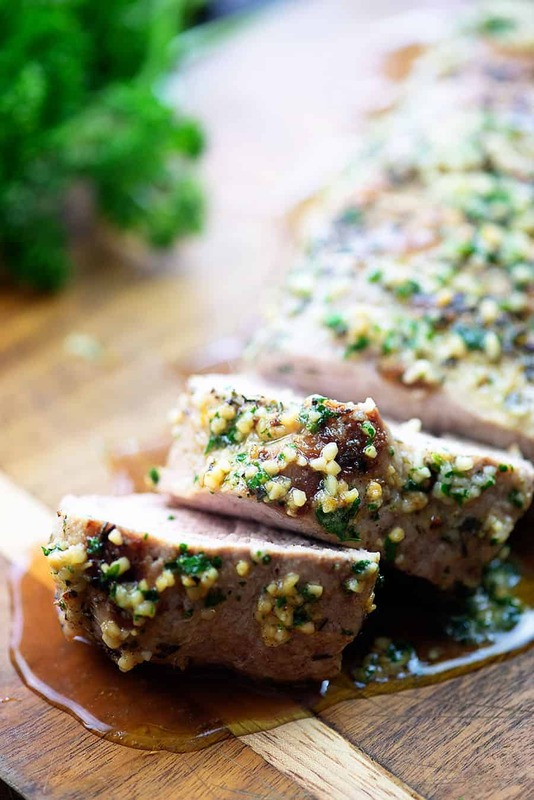 Garlic Butter Pork Tenderloin. Can you handle this amount of goodness? This looks and tastes like a fancy restaurant meal, but it was one of the easiest things I’ve made in a long time and it was ready in about 30 minutes. First up, grab a heavy bottomed, oven safe skillet. I used cast iron. 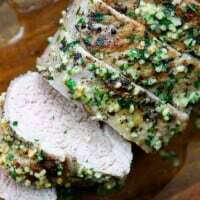 This oven pork tenderloin starts off with a little Italian seasoning, salt, and pepper. Just sprinkle it all over on both sides. Add some olive oil to your hot skillet. Once the oil is hot, sear the pork on both sides. We’re locking in the juice and adding a ton of flavor by searing the meat before putting it in the oven. Don’t skip this step! 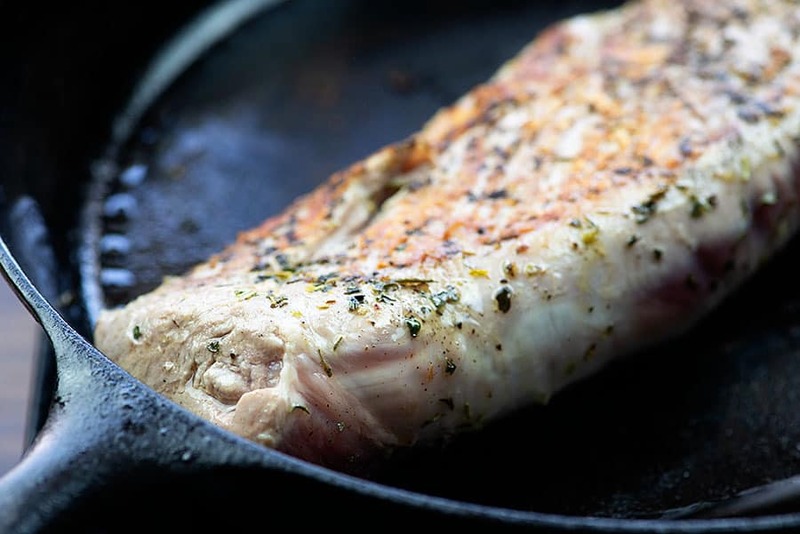 For baked pork tenderloin, we’re going to need to do a little oven time. Pop the whole skillet into the hot oven and let it cook for about 15 minutes, depending on the level of doneness you prefer. Did you know that pork isn’t required to be cooked to well done? I like to cook my pork until it’s just oh so slightly pink in the center, so I pull it from the oven at 145 degrees and let it rest for about 5 minutes before cutting. You can safely pull your pork anytime after 145 degrees and up to 160, if you like it well done. Just allow the pork tenderloin to rest for at least 5 minutes before slicing. We’ve already started it out with a little Italian seasoning, salt, and pepper, but now we’re going big and bold. Once your pork is cooked and rested, melt together a little butter, a lot of garlic, some onion powder, and fresh parsley. Pour it right over the top of your tenderloin. Can’t you just smell it when you look at the photos? So. Good. 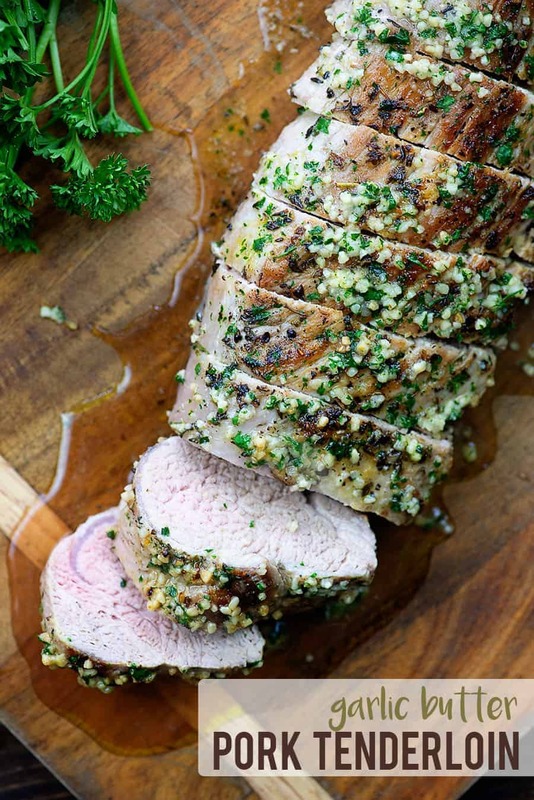 There are so many delicious low carb side dishes that would work with this pork tenderloin! My fried radishes are a great sub for potatoes and I think they work perfectly with this tenderloin recipe. Keto coleslaw is always a win with any type of meat. Brussels sprouts and bacon would make a lovely side dish and so would this cauliflower mac and cheese. You could also keep it simple with a fresh green salad or some zoodles tossed in a little sugar-free marinara. 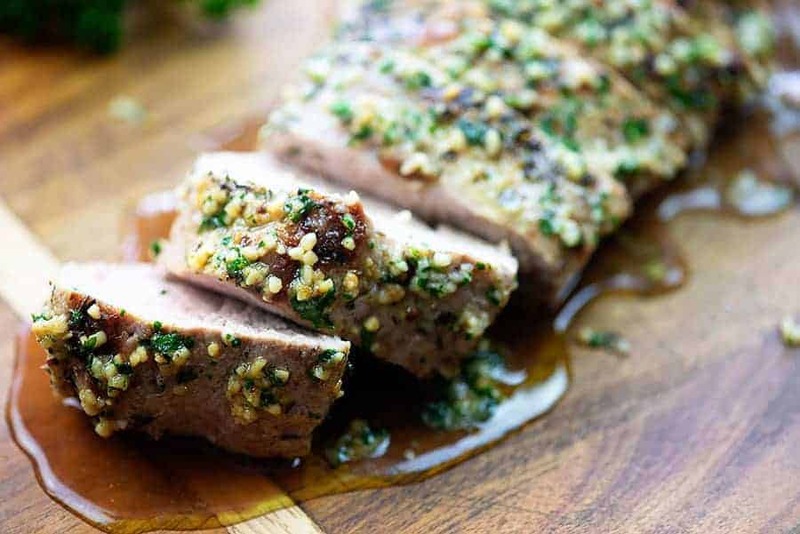 This pork tenderloin feels like a fancy restaurant meal, but it's ready at home with minimal work in just 30 minutes. Season all sides of the tenderloin with Italian seasoning, salt, and pepper. 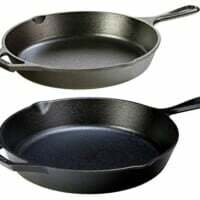 Heat oil in a large heavy-bottomed skillet, such as cast iron, over high heat. Add the pork to the skillet and sear for 2-3 minutes per side. 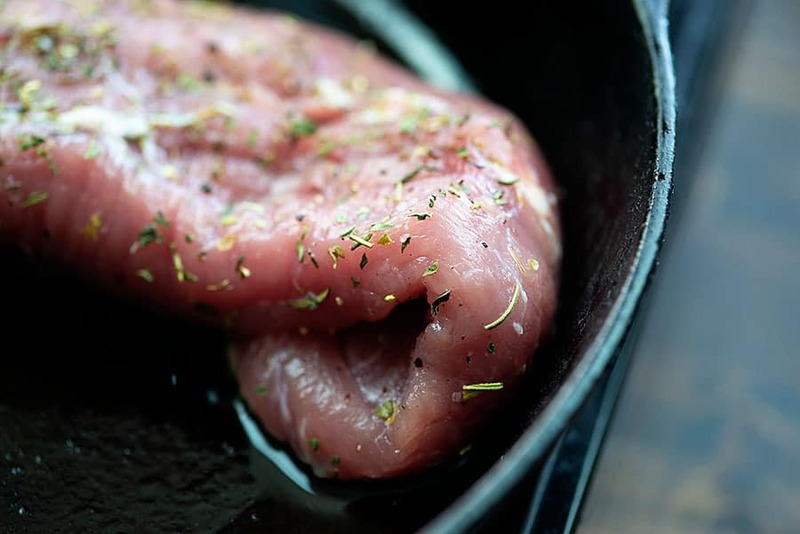 Transfer skillet to the oven and bake for 15 minutes or until the pork reaches an internal temperature of 145 degrees. While pork is resting, whisk together the butter, garlic, onion powder, and parsely. Wondering if anyone has tried this in the instapot? Wow! Delicious and easy to prepare! Is it best to use fresh garlic you mince or is the jar of minced garlic ok? 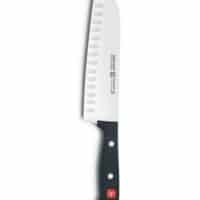 I was looking for a low carb menu and recipe for pork tenderloin to make for friends we were hosting for dinner. I was happy to come upon your site-( it looks great btw) and the pictures of this almost made it possible to SMELL the deliciousness! We had a 4lb pork tenderloin that we cut into two pieces and I marinated it a bottle of Italian dressing the day of. I followed your directions exact- and did the searing and cooking in our cast iron pans. THIS WAS THE BEST PORK TENDERLOIN I’VE EVER MADE!! Our friends were absolutely blown away and raved about the meal. I served it with roasted honey acorn squash topped with butter/brown sugar and a few toasted pecans along with steamed green beans. Yay! So glad this was a hit! Your whole menu sounds amazing! Delicious! Best pork tenderloin I’ve ever made or tasted! I did not fully read the instructions before starting and did not have all the ingredients but it worked very, very well. First I had a small tenderloin of less than a pound. I used olive oil in a heated up pan but I only seared it 15-20 seconds a side until it was white but not cooked much. Flipped it four times… entire thing was whitened. Then having not read the actual recipe just the intro and only having 2 table spoons of butter… Before I seared it I shook a bit of salt, quite a bit of pepper and a couple of pinches of mixed fine herbs. Then I melted the butter and mixed in 2 tablespoons of refridgerated minced garlic, plus a few drops of a mild honey habenero sauce. Then I covered the pork tenderloin in the melted butter and garlic mix. Before baking. It was not a lot and I covered one side, flipped it over and most of it stayed on or under the tenderloin. I baked it around 25 minutes at 425 degrees. And it was just the tiniest bit pink in the thickest spot only. Perfect. I am sharing it because it worked so well and was so moist and this way you likely end up eating less butter. And I used a fraction of the salt recommened. One of the juiciest I have ever made. Even compared to a slow cooker literally cooking it in liquid. I tasted the garlic. Next time I might add more hot sauce. I barely noticed it, i did not want it spicy or hot, just a little extra zest and in trying not to overdo it I likely should have added 2-3 times as much to get even a mild kick. Amazing!! I have recipe fails all the time, to the point where I just go back to cookbooks buttttt this is fantastic. Honestly best pork tenderloin I’ve ever had, easy to make! And I get to use my cast iron skillet! Best recipe ever – thank you for sharing. Really delicious. Have made this time and time again and my household just loves it. Delicious! Just one tweak…before slicing, I glazed the pork with Thai Sweet Chili sauce. Serve it with some veggie egg rolls and guests will rave. I don’t often cook pork as I usually am not a big fan, but this was fantastic. It was enjoyed by all, and will be added to my recipe rotation! So yummy! I wonder if I could make this on the grill? What do you think? Yep, I think it’d be great on the grill! Wow very impressed!!! I have just flipped most of my tenderloin recipes out for this one. My autistic grandson who is 12 yrs old is very hard to please with food, but he really enjoyed this dinner, and asked me to make it again soon. So thank you very much. I will be trying more recipes of yours again very soon! This was so simple and so delish! You can pair it with anything, quite versatile! Thank you so much! Fabulous! Quick, easy and delicious! Will definitely make this again and again! Have made this twice. Very tasty and easy both times. Thanks for sharing. Oh my goodness, this was delicious!! My usual pork tenderloin dishes are too sugary for low carb, so I needed something new. This was fantastic!!! I didn’t have any fresh parsley on hand, so I just added a little more Italian seasoning to the garlic butter. Served this with roasted asparagus and shredded brussels sprouts sauteed with a little more garlic and some pine nuts. Very satisfying! Made this tonight and it was a big hit! Came out perfect! Just a heads up. 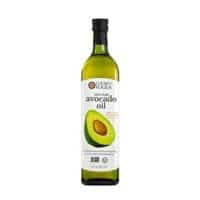 Your recipe says avocado oil in the ingredients but it says olive oil in the instructions. I don’t have avocado oil so I used olive oil. Just made this and it turned out really good, very quick and easy too! It has really good flavor, will make again.